I'm going to consider "Starter Template" of the 2016 edition. 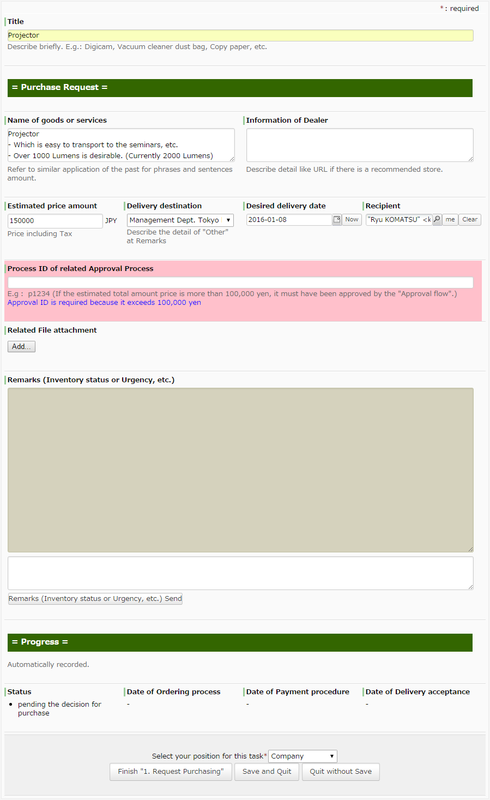 This time, it is going to be the 2nd of the series, "Procurement Request" in simplicity. 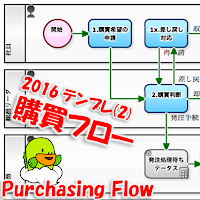 This procurement flow is a Workflow that allows you to comfortably make requests for anything you think you want to or should buy. 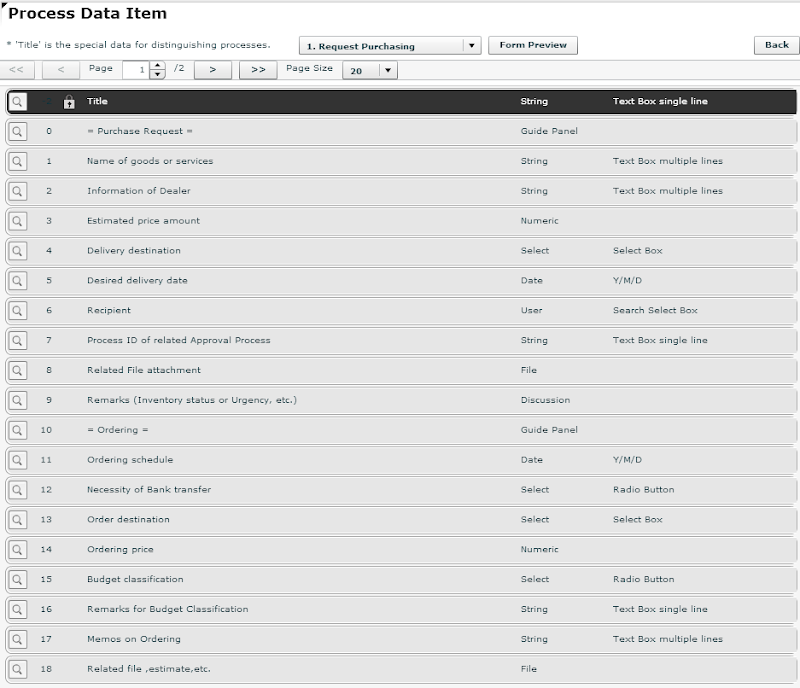 That is, it is possible to request for anything, as long as being an employee, from consumable goods such as "copy paper", "drinking water", or "detergent", to fixtures like "desk", "vacuum cleaner", or "personal computer". However, it is left to the Procurement Department for actually whether or not purchased. Especially, for those difficult to determine the need and urgency, it will be in a status of "pending the decision for purchase" for long term. 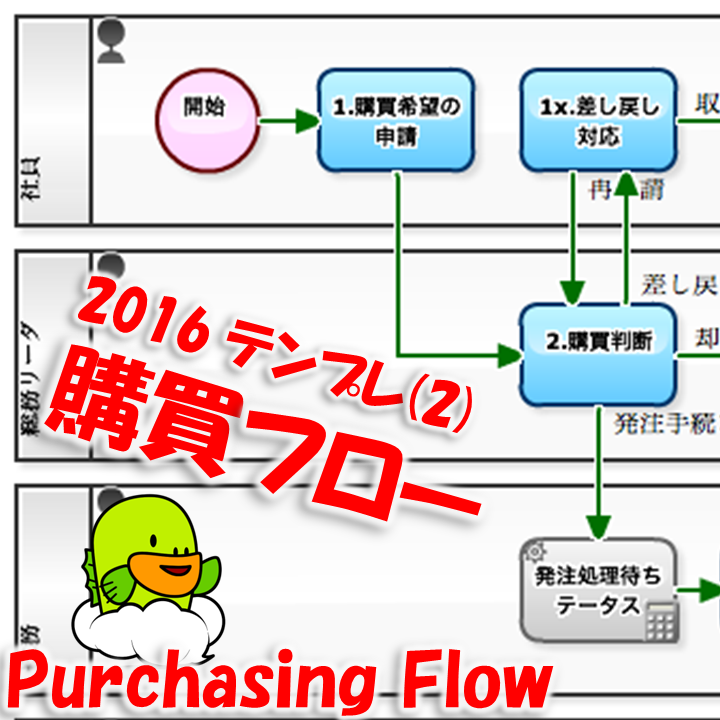 Incidentally, "being approved on the Approval flow" in advance will be the premise of purchasing of the "application for purchasing items of more than 100,000 JPY ". Each the application will follow a variety of fate, such as "pended" or "rejected". Also, in the reality, purchase will be "compiled" for convenience of including the delivery fee in some cases. Regardless of whatever the result is, or which status it has been through, all of the application will be recorded. It is also good to export the accumulated records and try to do look back analysis at the end of the year or quarterly basis. In the whole company or the entire department, how much of the procurement was carried out? How much was procurement fluctuation by the period? You will find out various trends. 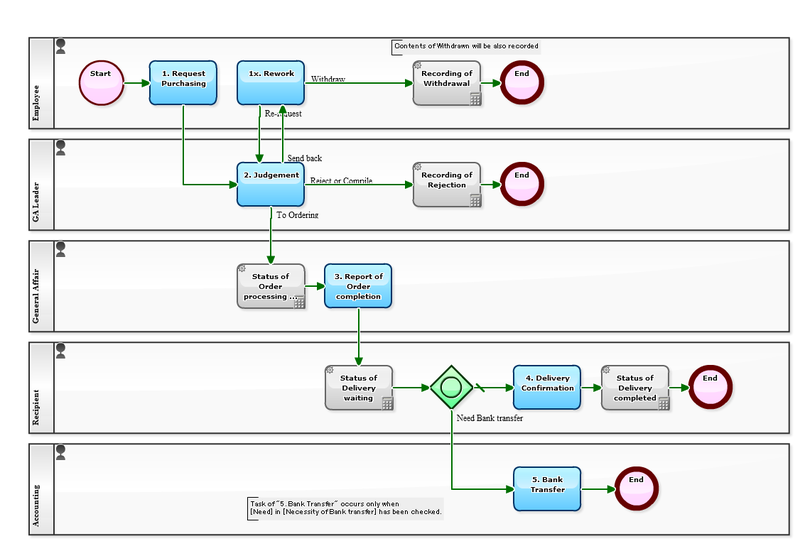 When you try to experience this Business flow on "Questetra BPM Suite", a Cloud-based Workflow, I recommend to create User accounts of 4 to 5 people. That's because in the default state, only one User is registered in the system, so you will not be able to real experience the roles of "General employee", "General Affair", "Leader of General Affair", and "Accounting".